Further to it, the USCIS has also announced that an ample number of petitions for H-1B to meet the twenty thousand visas for the United States advanced degree exemption. Also termed as master's cap. 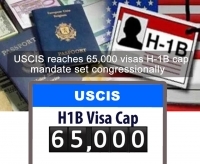 The USCIS had indicated earlier last year that the government is going to follow tough and very stringent methods while granting approvals for the H1B, although it did not mention how or by what method the government is going to select the successful applications. Up till now, the government had been doing the selection through the computerised draws. Furthermore, the official statement released by USCIS added that ” Yet, too many American workers who are as qualified, willing and deserving to work in these fields have been ignored or unfairly disadvantaged. Protecting American workers by combating fraud in our employment-based immigration programs is a priority for the USCIS." The US H1B visa is the most sought after non-immigrant visa which permits the firms in the United States of America to deploy employees from overseas countries into the job profiles that require academic or technical expertise. The technology companies depend on it to hire tens of thousands of employees every year.